A very happy Elliot Westacott from Haywards Heath, from doing his CBT with us on the 12th he now has a full licence with only 2 minors, what a superb result! Elliot says – Passed everything today! Thank you again so much for all your help – the instructors have all been fantastic! I ll definitely be back for further training after the bike shopping spree has ended! 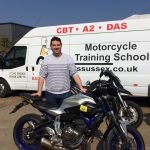 Started from basically zero experience did CBT and DAS course all in a row – 4 days worth of training and passed everything first time with only 1 minor – that’s not credit to me as a rider but to MTS for the outstanding training they provide. The instruction is relaxed and incredibly informative and all the instructors are truly great at what they do. I wouldn’t hesitate in recommending MTS to anyone looking to get into biking or for bikers looking for advanced training. Thanks so much Max, Ric, Matt and Nikki!